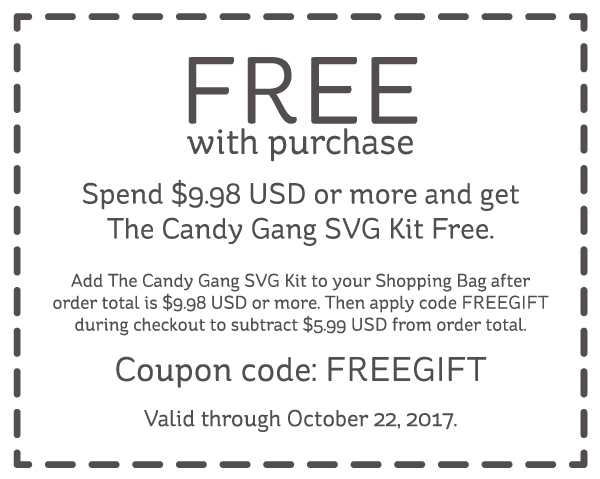 THEN add The Candy Gang SVG Kit to your Shopping Bag. This will deduct $5.99 USD from your total, thus making the new SVG Kit free. Promotion is valid through October 22nd, 2017! Any cutting machine software that allows you to import SVG files, such as Cricut Design Space, Sure Cuts a Lot ("SCAL"), eCAL, ScanNCut Canvas, Make the Cut, or Silhouette Studio Designer Edition. Not designed for mats smaller than 12x12.